Samsung has used a Russian developer conference to show off its plans for its proprietary smartphone platform. 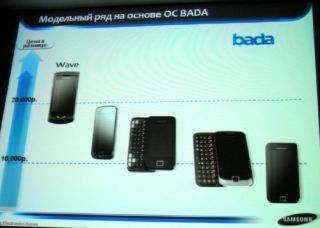 The Korean company will be releasing four new phones in the near future based on Bada, on top of the forthcoming Samsung Wave. There's very little information on the new phones apart from the slide depicting them - but we can see they'll all be cheaper than the Wave. The new Bada phones will come in two forms, two full touchscreen devices and two with horizontally-sliding QWERTY keyboards, like the Genio Slide. The Samsung Wave has been tipped to cost north of £450 SIM free, with the newer Bada phones coming in between £400 and £150. Samsung also showed slides depicting how it believes it will be the number one phone supplier in the world this year - moving onto 40% market share compared to Nokia's 38%.